Ever feel like you’re stuck in the weeds and can’t see what’s right in front of you? When I look back at my time working as a full time employee at a start up, one thing that rings loud and true is that we all suffered from what I call tunnel vision. Tunnel vision is the inability to see the obvious because you are so focused on the scenario in front of you. You’re so deep in the weeds of your idea, product, or company that you can’t see from an unbiased perspective. Don’t get me wrong. Focus is great. Focus is necessary. Focus is an amazing skill. But not being able to continuously switch between focusing on the details and coming up to see the big picture, can lead to a skewed perception of reality. And next thing you know, you’ve spent a ton of time and money building a product or feature that maybe no one wanted! I’ve spent the last 2.5 years working with a variety of companies at all stages. Some of the companies are startups and are in the early stages of getting the first version of their product launched. Others are established companies with a product in the market that are trying to improve their user experience based on data and customer insights. One thing is true of all these companies though. They all suffer from tunnel vision. They all simply can’t see obvious problems, quick wins, and new amazing opportunities that are staring them right in the face! This results in companies spending a lot of time and money focusing on the wrong things. How do you get out of the weeds? So, how do you change your perspective? How do you regain the balance between the details that matter and the big picture perspective that’s necessary to stay ahead of the market? What you need is a fresh new perspective. You need someone who isn’t stuck in the weeds of your product, who can see the big picture, and help you focus. You need a UX Copilot. This is why I’ve created a new service, The Product Evaluation, which is designed to help you get out of the weeds, and have someone to work alongside you to plot the course of your product and user experience. What is a Product Evaluation? 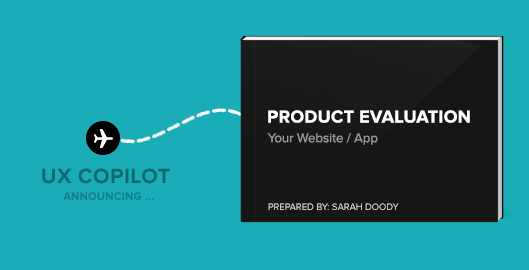 The product evaluation will give you a comprehensive view of your product including usability analysis, quick win changes, A/B test suggestions, and roadmap ideas so you don’t feel confused, overwhelmed, lost, and unsure of where to start. What’s included in a product evaluation? The product evaluation is broken into three phases, designed to help me gain a holistic view of your product so that I can then create the detailed report and give you actionable ideas and suggestions to improve your product experience. In our initial meeting via phone and screenshare, you’ll walk me through your product and tell me about your current hurdles, limitations, and future goals. We’ll also discuss any analytics and insights you may have available and also identify the 5 key screens that you want me to focus on. Your 20 – 25 page report in PDF format will detail the findings, recommendations, and action items focusing primarily on usability, messaging, experience, and key user flows. The Product Evaluation will include fully annotated screen shots of your product to help identify specific opportunities for improving usability and overall user experience. I don’t want to just give you a report, I want to help hold you accountable, answer questions, and encourage your ongoing growth and business. Within 30 days of receiving the Product Evaluation, you’ll have the opportunity to do a call with me to ask questions, show me your progress, or talk about any new challenges you’re facing. I’ve worked with enough companies to realize a common set of symptoms that each company faces at one time or another. Too many teams spent far too much time and money focusing on the wrong things. This leads to products that are bloated with features and have confusing user experiences, while the product team loses momentum and feels burn out and a lack of passion for the product. You just have to re-frame your perspective and help your team see the big picture that they used to be able to see. You have to stop focusing on features and start talking about people and your product at a holistic level. The Product Evaluation is designed specifically to help you and your product team focus on the details that matter and make small incremental changes that will help you get results, create momentum, and stay focused. Interested in a Product Evaluation? Each month I allocate time to conduct 5 Product Evaluations. To make sure you and your product will benefit from a Product Evaluation, I ask that you fill out a short questionnaire so I get to know you. A few days after, I’ll be in touch to let you know if you’re a fit and the timeline for when it will be done. The pricing depends on the number of screens, complexity, and whether your product is a desktop or mobile experience. This is a great way to work with me if you have a limited budget or timeline and can’t commit to a larger project. Click here to get started with your application for a Product Evaluation.